Most of us have a first-aid kit in our homes to treat minor scrapes and burns. But what about our four-legged friends? What happens when Fido gets a cut while trying to jump the fence? Or when Mittens steps a little too close to the wood stove? These basic herbal remedies for pets can make it easier to deal with inevitable mishaps, and may even save you a trip to the vet! To build a simple first-aid kit for your household pets, you will need a few basic supplies. Flexible bandages, such as the PetFlex no-chew cohesive bandage, are a great place to start. A salve is only good if you can keep your pet from licking it off. You will also need scissors for cutting bandages and removing contaminates from fur, as well as a pair of tweezers for removing splinters, or other small, foreign objects. When an animal has a burn, aloe is your best ally. Simply break off an aloe leaf and squeeze the gel-like substance onto the affected area. If you do not have an aloe plant, consider adding aloe gel or juice from your local health food store to your first-aid kit. If you buy aloe gel at your local pharmacy or supermarket, be sure to check the alcohol content, as some brands contain more alcohol than aloe. Learn more about aloe here. * Topically, aloe gel is considered safe for dogs, though the leaves of an aloe plant can be toxic if ingested. Please use caution when treating dogs with aloe and learn more about choosing the best aloe for your pet here. As anyone with a pet knows, animals have a habit of eating all manner of things—everything from the stick of butter left out on the counter to their very own beds. While some literature suggests keeping activated charcoal on hand for accidental ingestions, it should only be used in extreme circumstances, and under the strict supervision of a veterinarian. A better, and generally more accessible, treatment is one that you have probably seen animals self-administer: couch grass. Couch grass, also known as dog grass or quack grass, is a vigorous perennial that grows in fields and untreated yards. Animals will often munch on this grass or dig up its roots when they have eaten something they shouldn’t have. They know best, since couch grass gently induces vomiting. When couch grass appears in the spring, dig up the rhizomes and dry them, either by hanging them in a cool, dark place, or by using a food dehydrator. Keep a jar of the dried rhizomes in your first-aid kit and add them to your pet’s food to induce vomiting and soothe the digestive tract. When treating cuts and scrapes in animals, it is best to use a two-fold approach. First, you need to clean the wound and stop the bleeding. Second, you need to treat and bandage the wound to prevent infection. To clean wounds, keep a small squirt bottle filled with water in your first aid kit; an old bicycle water bottle works especially well. Use the water bottle to flush the wound and pat the area dry with a clean cloth. To stop bleeding, a good herbal first aid powder will work wonders. 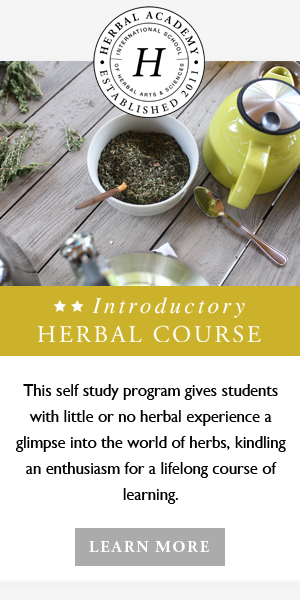 The herbal first-aid powder recipe below uses yarrow—known for its antiseptic and styptic properties—and cayenne, which increases circulation to the affected area, while simultaneously relieving pain. Yarrow can easily be foraged, or you can get it here. Add the cayenne pepper and yarrow to a mortar and pestle or food processor. Grind the mixture until it reaches the consistency of table salt. Add the resulting mixture to an old herb container with a shaker top. *Using this herb powder may initially increase your pet’s pain as the capsaicin in the cayenne works to block the nerve endings. The hotter the pepper, the higher the capsaicin content. After you have let the cayenne pepper/yarrow mixture sit on the wound for approximately 10-15 minutes, or until the cayenne has had a chance to stop the pain, and the yarrow has stopped the bleeding, you are ready to move on to step two: dressing the wound. A good salve is not only a must for your pet’s first-aid kit, but your own, as well. Luckily, you can use the recipe below for you and your pet! Store this salve in small, 4 oz. jars, and you will have plenty to stock both first-aid kits. Place all the ingredients, except the beeswax, in a large sauce pan. Heat ingredients, until just before boiling. Simmer at this temperature for 90 minutes, stirring and watching the mixture closely to ensure it does not boil and that herbs do not burn. Remove from heat and strain the herbs. Return the oil to the saucepan and add beeswax, stirring until melted. Pour into glass jars to store. What makes this salve a healing powerhouse is the cocktail of herbs it contains. Calendula inhibits bacterial and fungal growth and serves as a vulnerary (more on calendula here). Cleavers removes toxins and reduces swelling. Plantain, whose leaf can be picked and applied directly to a wound when in a pinch, is a great anti-bacterial. Finally, comfrey root will cut the healing time of the wound, which is important when you are dealing with animals. The quicker you can bring healing, the more likely your pet will leave the area alone. To dress a wound, apply the salve to the affected area and wrap it with a bandage. While there is nothing in this salve that should affect the animal if they ingest it, it is important to discourage licking to give the wound a chance to heal. Check the wound daily and routinely change bandages. An herbal first-aid kit can be an effective first line of defense when you’re dealing with an injured pet. By treating minor wounds naturally, you can give your pet the care they need with fewer side effects. Nevertheless, you should always keep a close eye on your pet when using an herbal remedy for the first time. Like humans, pets can have sensitivities and allergies to a variety of things. And no matter how well stocked your first-aid kit may be, it is not a substitute for veterinary care in emergency situations. Always consult your veterinarian when in doubt. Even in cases when a trip to the vet is necessary, your herbal first-aid kit will give you peace of mind that you are able to comfort your furry family member when they are in need.